Class B G protein-coupled receptors (GPCRs) comprise a family of 15 peptide-binding members, which are crucial targets for endocrine, metabolic, and stress-related disorders. While their protein structures and dynamics remain largely unclear, computer modeling and simulations represent a promising means to help solve such puzzles. 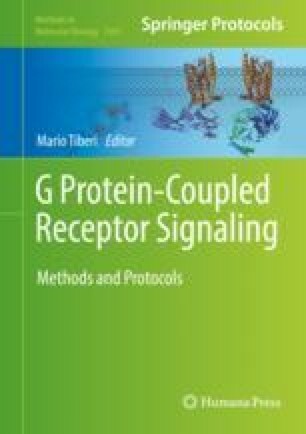 Herein, we present a basic introduction to the methodology of molecular dynamics (MD) simulations and two analytical methods to assess the conformational ensembles and transitions of Class B GPCRs, using our recent studies of the human pituitary adenylate cyclase activating polypeptide (PAC1) receptor as an example. From long MD simulations, conformational ensembles with different roles in ligand binding and receptor activation are sampled to establish four states identified as either “open” or “closed” for the PAC1 receptor. Next, the dynamical network can be applied to analyze the simulations and identify key features within each conformational ensemble, which help distinguish the ligand-bound states of the PAC1 receptor from the ligand-free one. Further, the Markov State Model has emerged as a key approach to construct the transition network and connect the GPCR ensembles, providing detailed information for the transition pathways and kinetics. For the ligand-free PAC1 receptor, the transitions within the closed states are near 10–30 times faster than the open-closed transitions, which is likely related to the activation mechanism of the receptor. Overall, long MD simulations and analyses are useful to assess conformational transitions for the Class B GPCRs and to gain mechanistic insight, which is difficult to obtain using other methods. Computational resources were provided by Anton (PSC, NIH P41GM103712-S1), Stampede (XSEDE, NSF ACI-1053575), and Vermont Advanced Computing Core (VACC). J.L. and V.M. thank the UVM REACH grant and the National Institutes of Health (NIH) under Award Number R01GM129431 for the funding support.